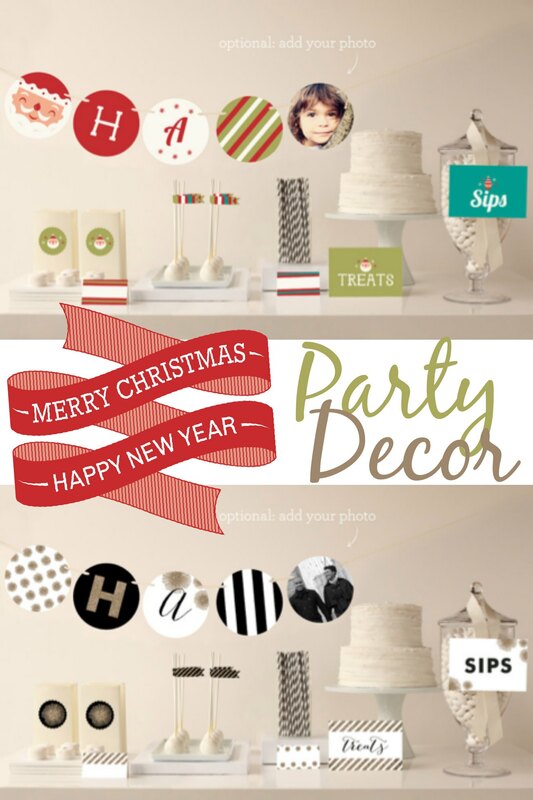 If you’re hosting a party this holiday season, you have to check out the awesome holiday party options from Minted! If you’ve never heard of Minted before, It’s a global com­mu­nity of inde­pen­dent graphic design­ers and an online store that prints and sells the best of their designs in the form of paper goods. And do they ever have awe­some paper goods–everything from holiday cards (& gifts) to wed­ding invi­ta­tions & birth announce­ments to birth­day invi­ta­tions and more!Seri­ously, there are so many great prod­ucts! We actually used some of Minted’s pirate party decor for our Jake & the Never Land Pirates party last spring! So, I was thrilled when they sent me some holiday party decor to check out! That’s the Happy Santa Party Decor for Christmas and the Glitter Everywhere decor for New Year’s! Those are the styles that I thought fit our holiday style best, but they have so many other options! And, what I love is that everything is such high quality that much of it can be stored and used over and over again! The Happy Santa line is perfect Christmas decor even if you’re not having an actual party! In fact, we have the large bunting banner hanging on our stair railing & I love it. It’s so fun and merry! 🙂 Isn’t it cute?! 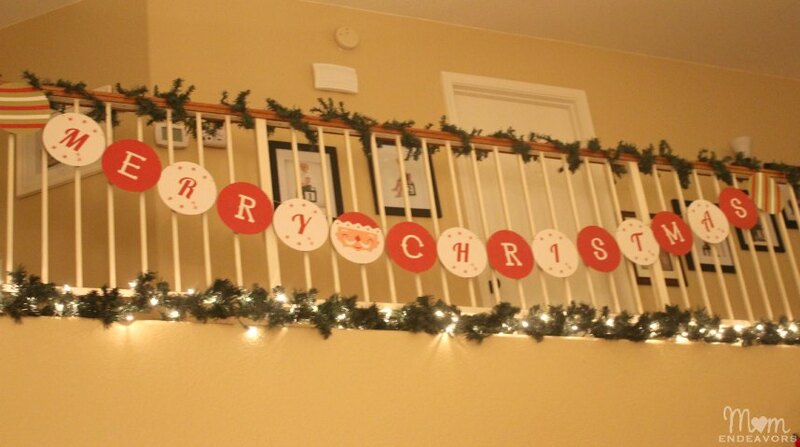 It definitely adds some Christmas cheer to an otherwise very plain upstairs railing! Some of our other “Happy Santa” pieces will be great in the kitchen! And, I’m super excited for our New Year’s Decor. Often times, the New Year’s Eve party decorations that I see out in stores is rather cheesy. But, the decor from Minted is SO classy & chic! I LOVE the glittery gold & black in the “Glitter Everywhere” line that I got. My in-laws are normally here over New Year’s and we normally try to have a nice dinner & fun evening. So, I’m excited to have some color-coordinated party decor for this year! Isn’t it fun?! I can’t wait to use it for New Year’s! 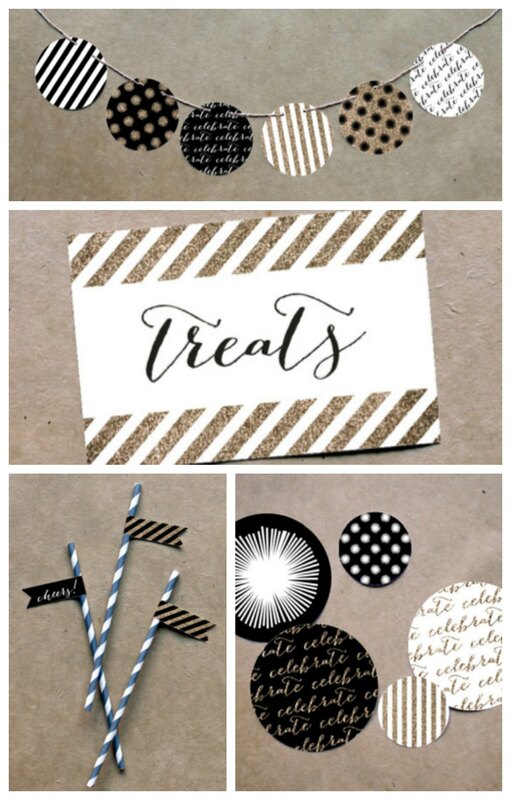 In the mean­time, if you’re look­ing for any kind of party decor (or announce­ments, invi­ta­tions, or holiday cards) be sure to check out Minted! What kind of holiday party decor do you like to purchase? Dis­clo­sure: I received the prod­ucts shown above for review. As always, all opin­ions and expe­ri­ences are entirely my own!